ZF has launched a reference design for an Energy Harvesting Bluetooth Low Energy Switch in partnership with ON Semiconductor. The design combines ZF’s energy harvesting generator with what is claimed to be the industry’s lowest power Bluetooth 5 radio RSL10 SIP from ON Semiconductor and is the perfect solution for the rapidly growing number of applications for BLE communication. The generator, combined with the RSL10 SIP, allows designers to produce bespoke battery-free and wireless control solutions for a broad range of low cost, low-energy applications. The transmitter is intended for evaluation. 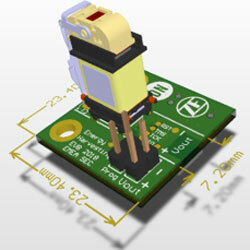 For integration into an application, the PCB wings can be cut to size. The reference design runs in Advertising Mode with uni-directional uplink communication and provides various pairing options. The operation can be displayed via a smartphone app (IOS: Bluetooth Smart Scanner and Android: Bluetooth Low Energy Analyser) which shows all received telegrams. A supporting demo kit based on the reference design for the switch, and ON Semiconductor’s Bluetooth IoT kit is also available.